If you’re here for the best flea collar for cats, but you’re too busy to read all the details of this guide, here is what Dr. Fox has to say to you. 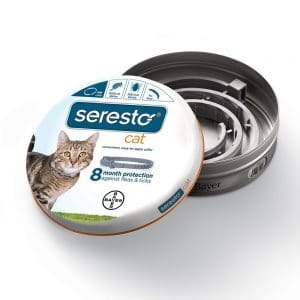 Based on the comparison made between the most critically acclaimed collars for flea control on the market, the conclusion is that the Bayer Seresto 81857952 should be on top of the list. This model protects against fleas and ticks for 8 months, which is longer than what most other models offer. The formula is non-greasy, and you don’t have to worry about leaving a nasty odor. It is a good fit for all cat weights and sizes. If you cannot find the Bayer Seresto 81857952, try the Rolf Club 3D Collar as the second alternative. 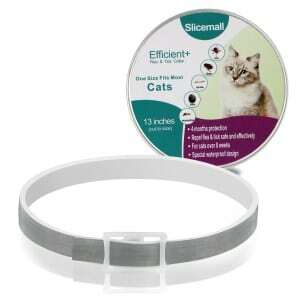 This flea collar is effective for up to 8 months, making it a convenient option for owners who don’t wish to replace their cats’ collars too often. The Bayer Seresto is also fast active, killing the present fleas after just one day and eliminating in only two hours any other parasitic insects that may reappear. Some buyers have noted that, even though the collar is very effective against the fleas, it may cause irritation to the area around it for cats with a history of sensitive skin. 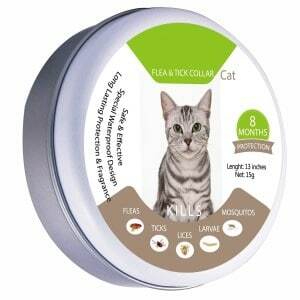 If you’re looking for a permanent solution to your cat’s flea problem, this odorless flea collar is an option you should strongly consider, as it provides fast-acting protection over a long period of time. This product is designed to fit any-size cat and it is effective against eleven types of parasites, including ticks, fleas and larvae. 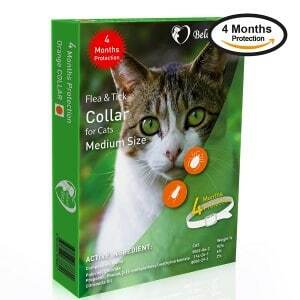 Engineered with natural ingredients, this odorless collar provides up to four months of protection. 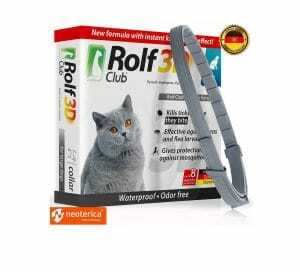 The Rolf Club 3D Collar is quick in its effect, killing fleas within the first 3 days. Even though this product protects from a large variety of parasites, some pet owners have noticed that it is not as effective against severe cases of flea infestation. 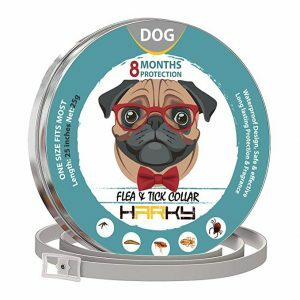 This flea collar is a great buy for owners who are looking for a product that goes the extra mile to make sure that it has a long lasting effect against parasites, while keeping your pet safe from allergies or irritation. For owners who want a stylish collar that protects their cats against flea eggs, ticks and itches, the Harky for Cats unit is a very good choice. This waterproof collar boasts an impressive efficiency of up to eight months and comes in a one-size-fits-all adjustable design, which is an advantage in itself. While the combination of natural oils does release an enjoyable scent, this product might not be the first option if you want a completely odorless collar. This collar provides a long lasting effect on your pet, as well as keeping your house free of any future re-infestation; all of this, while making sure that your feline buddy is not affected by any skin allergies. A good flea collar should be able to protect your cat against reinfestations, and not just kill the fleas that are present in the pet’s fur. 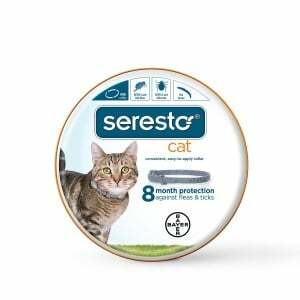 The Bayer Seresto 81857952 is an option for owners who do not want to replace the collars on their pets too often. With a long lasting action of up to 8 months, this model is more efficient than many others on the market. Besides being an excellent solution for preventing infestation over such an extended period, it is also fast active. It takes just one day for the active ingredients to kill the present fleas. Also, any fleas that may reappear will be eliminated in only a couple of hours. The ingredients do an excellent job against eggs and larvae, too, and they protect the cat from ticks, as well. Because it is a good fit for cats of all sizes and weights, it can be used just as well for a kitten or an adult cat. This Germany-made product offers four full months of protection. It is odorless and it helps your cat get rid of internal and external parasites. It works against eleven species of parasites, including Uncinaria, Trichuris, and Toxocara, and it’s more effective than oral medication which is great if you want to save money in the long run. The result is seen in less than three days, which is impressive. The unit is also easy to use, and it fits both kittens and large cats due to its clever design. Moreover, it will help you save money since it kills off worms and fleas without having to force your companion to ingest pills. Utilizing German technologies, the cat flea collar causes no harm to your furry friend. It is made from natural elements, and the flea repellent works even if your cat gets wet. There’s hardly any area that’s left untouched by the manufacturer so that you can rely on it for fast and long-lasting results. One thing is for sure – this product offers incredibly durable results. It is effective for up to eight months, and it protects your furry cats from flea eggs, itches, and ticks. The product will keep your home free of pests or bugs as well, which makes it the ideal solution for preventing reinfestation. The HARKY collar is fully adjustable and it comes in one size that can fit most cats, no matter their body size. It’s waterproof and has a release mechanism that guarantees equal results for the entirety of its lifespan. Moreover, the collar also comes in quite an attractive color, so those who like stylish products will be satisfied. It contains natural essential oils, all of which are not harmful and release a pleasant smell. You can even give your pet a bubble bath, and the collar will still kill off fleas quickly. Moreover, it is environmentally friendly, and it won’t cause any allergy. You will get 4 months of continuous protection against fleas and ticks for your cat when you pick this particular model praised by many of the flea collar reviews you can read online. The collar is non-toxic, so it does not contain any harsh chemicals that may affect the cat’s health if that is of concern to you. You will be able to treat your pet against existing fleas and prevent them from reappearing, as this collar will act as a repellent just as well. 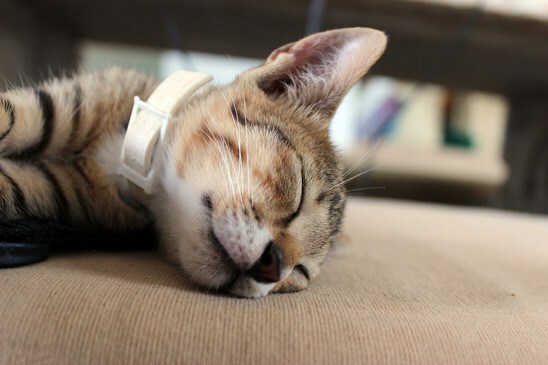 The pesticides in the cat’s collar will be slowly released, preventing new generations of fleas from appearing. This model is a good option for cats that are at least two months old. The collar can be adjusted to fit any cat’s neck, as long as you make sure that the collar has enough room to move around, without being too loose. Because it is water resistant, you can leave it on while giving your cat baths. The Beloved Pets Flea and Tick Collar is a highly effective solution to fleas and ticks, and can even repel other kinds of bugs that may bother your pet. 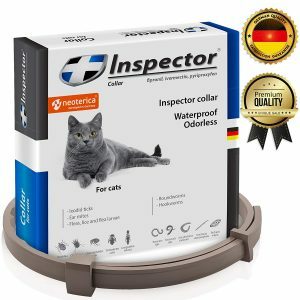 Because it does not contain any toxic chemicals, this collar is safe for your pet, and it will only kill the pesky critters that are disturbing your cat’s comfort. The collar has a long-lasting effect, and it will repel fleas and ticks for 4 months. You can choose from various sizes so you can pick one for your adult cat and another for your kitten. The active ingredients will be released slowly, and your cat will benefit from excellent protection. A great thing about this collar is that it is effective against fleas, ticks, as well as other pests, so your cat will get all around protection, without the need for additional treatments. The collar is easy to place around the pet’s neck, and it will only have to be replaced once every 4 months. When shopping for the best flea cat collar, you may feel a bit overwhelmed with all the solutions offered on the market. There are just so many models to choose from that it’s natural to feel a little lost. We are here to help you with actionable advice you can use to pick the right collar for your pet. The first thing that comes to mind when talking about all kinds of alternative flea medicine for cats, seeing that there are so many topical solutions, oral medication, and collars, is how safe the chosen treatment is. Fleas are usually killed with chemicals, and that is something everyone knows. But there are things to consider here if you want your pet to be completely safe from falling ill due to the excessive use of pesticides. Search for models that are approved as non-toxic. These are most likely not to trigger allergies and other unwanted reactions in your cat. However, if you want to be entirely sure that your cat is well protected, while its health is not affected in any way, you must know that there are 100% natural solutions for protection against fleas. The active ingredients in these collars are not pesticides, but natural oils that repel critters without posing a health risk for the pet and your family. The best collar for fleas should be easy to adjust. There are manufacturers on the market that offer one-size-fits-all solutions, and there are also others who prefer to sell multiple sizes. Most pet owners prefer the adjustable solution because cats are not all the same. There are different breeds, and also, if you want to protect a small kitten, it will not be easy to find a really small collar. Always read the instructions offered by the manufacturer carefully. After adjusting the collar, you will have to cut the excess, so that it doesn’t become bothersome for your cat. Even great cat flea treatment can fail if you make it too uncomfortable for your furry friend. Make sure to leave enough room for the collar to move a little bit, but don’t let it too loose, either. This way, your cat will be well protected and comfortable at the same time. You want the treatment you use for your cat against fleas and ticks to last. Manufacturers talk about how long the ingredients will remain active in the collars they sell, and this is something to bear in mind. Most collars available will require replacement after 4 months, as that is when the active ingredients wear off. However, there are other, more efficient, collars available, and they can ensure an even longer duration of time during which your pet remains well protected. Find the solution that works best for you and your pet. If your cat tolerates the collar well, you will have nothing to worry about. Provide your beloved cat with the best protection possible, and it will be happy and healthy. Vets always advise cat owners to use flea and tick protection, if their pets spend a lot of time outdoors. You certainly do not want all kinds of critters to be brought home by your pet, infesting your home, and becoming a source of health problems. The Bonim Fully Adjustable solves all these problems by providing you with the right means for protecting your pet against fleas and ticks. One thing pet owners like about this collar is that it is odorless and non-greasy. Also, it must be noted that the collar is entirely water resistant, which means that you can safely bathe your cat without the need to remove it. The adjustable strap makes this collar a one-size-fits-all solution. You only have to place the collar around the pet’s neck, adjust it so that it moves around a bit, without being too loose, and cut the excess. This way, no matter which size your cat is, you will be able to adjust the collar to its neck. 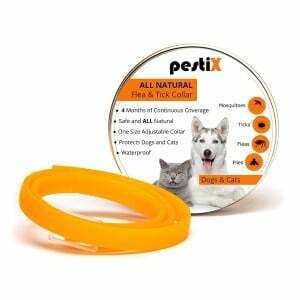 If you prefer a natural solution to the usual chemical-based treatments against fleas, the pestiX All Natural is the collar you should choose. With so many models available for sale, it may be a difficult task to find one model that does not come loaded with harsh and harmful chemicals. This particular model is just the right alternative. It is made with natural oils, such as cinnamon, eucalyptus, and lavender, that are repellent for critters like fleas, but not harmful at all to your pet and the rest of your household. A great thing about this blend of natural oils is that it manages to repel more than just the annoying fleas and ticks. It works just as well against mosquitoes and flies that can annoy your pet just the same. For 4 months, your cat will get perfect protection against the critters mentioned earlier. You can adjust the collar according to your cat’s size, but don’t forget to leave enough room so that the collar doesn’t rub against the pet’s skin.